Two eucalypt-feeding psyllids (Hemiptera: Psylloidea: Aphalaridae): the eucalypt shoot psyllid, Blastopsylla occidentalis Taylor and the red gum lerp psyllid, Glycaspis brimblecombei Moore are reported from Israel for the first time. Both species belong to Spondyliaspidinae, a subfamily of jumping plant lice that feed generally on Myrtaceae, mainly eucalypts. The psyllids were collected from Eucalyptus camaldulensis Dehnh., a dominant eucalypt species in Israel. 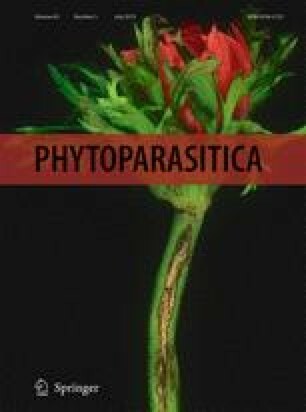 A summary of the global distribution and the host trees of the two psyllids are provided and their potential threat to eucalypts in Israel is discussed. Diagnostic information to distinguish between the two psyllids is presented, with an identification key for the adults of six eucalypt-feeding psyllid species in the Western Palearctic region. MS is grateful to the Swiss Federal Commission for Scholarships for funding her post-doctorate research at the Naturhistorisches Museum Basel, Switzerland. This paper is part of a larger study on Israeli psyllid systematics. We would like to thank Dr. A. Freidberg (retired, Tel Aviv University, Israel) for collecting the specimens of B. occidentalis. Thanks are also due to Dr. N. Dorchin, Mr. L. Friedman, Mrs. T. Stern and Dr. T. Novoselsky (Tel Aviv University, Israel) for organizing the loan and shipment of psyllid specimens to Switzerland for study. We thank Mrs. S. Kagan (Agriculture Research Organization, Israel) for providing information about eucalypts in Israel. Dr. D. Ouvrard (Natural History Museum, England) and an anonymous reviewer provided useful suggestions on a previous manuscript draft which is gratefully acknowledged. Conflict of Interest: We declare that there is no conflict of interest with the publication of this manuscript. No human/animal participants were involved in the preparation of this manuscript. FABI (2015). New Eucalyptus pest. Forestry and Agricultural Biotechnology Institute. http://www.fabinet.up.ac.za/index.php/news-item?id=51&more-publication=20. Accessed 24 February 2015. KKL (2015). Forest facts in Israel. http://www.kkl.org.il/afforestation-and-environment/afforestation/forest-data. Accessed 5 February 2015. Mifsud, D., Cocquempot, C., Mühlethaler, R., Wilson, M., & Streito, J.C. (2010). Other Hemiptera Sternorrhyncha (Aleyrodidae, Phylloxeroidea, and Psylloidea) and Hemiptera Auchenorrhyncha. Chapter 9.4. In A. Roques et al. (Eds), Alien terrestrial arthropods of Europe. BioRisk, 4(1), 511–552. doi: 10.3897/biorisk.4.63.